Local Harvesting Equipment | NZ Walnut Industry Group Inc. This page catalogues both small and large walnut harvesting equipment used by growers in New Zealand. The owners of the equipment shown here are happy to share information with fellow NZ Walnut Industry Group members. To make an enquiry use our Contact Us Page. These harvesters are constructed of stainless steel tubing and have solid plastic disks that pick up the nuts. This type of disk doesn’t collect as much orchard floor rubbish as spiky disks do. Bag A Nut’s are made in Florida and very popular in the United States. Above, an older style of Bag A Nut being used near Geraldine. They pick walnuts up well and are quite common on both walnut and hazelnut orchards in NZ. They work well in combination with a washing system that can remove, leaves etc. Alan Mathewson of The Hazelnut Co. acts as our local agent/importer. These pictures show various arrangements for towing a Bag A Nut harvester. Tim Armitage and Hugh Stevenson use systems like this. A simple walnut harvester mounted on a Kubota F1900 mower. This harvester uses solid disks and the nuts are collected in bins that go on the front. Ian Sheerin operated this machine for the first time in the 2015 season and says it’s effective and doesn’t pick up much rubbish in the way of twigs, leaves etc. Under construction in the workshop. This picture shows the position of the collecting bins on the front. This small French self propelled harvester efficiently collects nuts and expels rubbish. It harvests the walnuts into bins. It is very efficient and is suitable for orchards under 10 ha. One downside is that the bins fill quickly and need to be manually emptied. 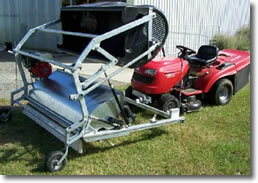 This machine is mounted on an old Kobota F1900 mower and was made by Nelson Hubber at West Melton. The walnuts are picked up by a “Bag A Nut spiky roller”. At the time the video was made the machine was in it’s third year of use and it harvested 7.5 tonnes for the season. Andrew and Jo Horsbrugh’s new machine at a parade in West Melton. Frank and Margaret Brenmuhl’s machine arrives at their property in Aylesbury. Clive Marsh and Heather North’s privately imported machine at their property on Shand’s road near Lincoln. Conditions in France are very similar to ours and so these AMB Rousset walnut harvesters fit into our New Zealand situations very well. Otto and Valda would be willing to negotiate a price for this to be developed and make it available to other growers. A web search suggests that it would meet criteria for international patent. We were excited to find this harvester which is made by Harvester Concepts Ltd in Fielding. It’s well priced and can fit in front of a variety of tractors. The collection bin lifts up and over the machine to deliver the harvest. As far as we know no-one uses one of these for walnut harvesting. It has an efficient pick up system so it would be necessary to have equipment that can remove leaves etc once the nuts have been collected. It is designed to pick up a range of nuts so is ideal for those growers with different varieties of nut trees. To find out more see Harvester Concepts web site . Contact us if you’re in New Zealand and have an interesting Walnut Harvester that we can feature on theses pages. Hi Do you have parts for Bag-A-Nut chestnut harvesters. . I am looking for tines and fingers.